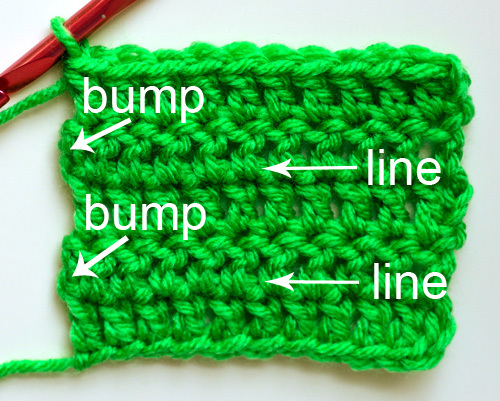 If you’re a beginner crocheter, it may be difficult to count your crochet stitches. The ability to count your stitches is extremely important if you want your project to turn out as intended. Counting stitches is a skill often learned with experience. The more you crochet, the more familiar the stitches will become making them easier to recognize and count. 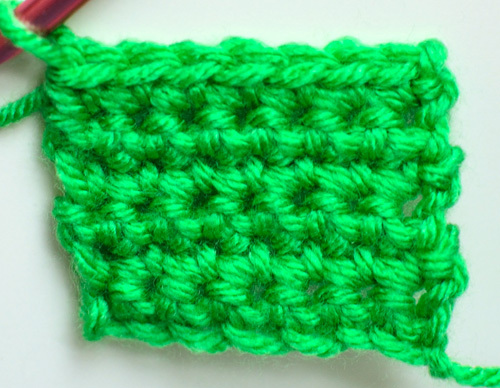 In this tutorial, I will show you examples of swatches I crocheted and give you tips on how to count the number of stitches and rows. Here is the first swatch I crocheted using double crochet stitches. How many stitches do you see on the top row? How many rows do you see? The answer is below the photo. There are 10 stitches on each row and a total of 5 rows. How did I count 10 stitches? There are a few methods you can use to count the stitches. My favorite method is to count the V’s on the top of the row. The top of each crochet stitch looks like a sideways letter ‘V’. If you can recognize the V’s at the top of the row, then you can count them to get the stitch count. How did I count 5 rows? Since I can’t see the V’s on each row, I count the post of the stitch instead. The post is the body of the stitch. Keep in mind that the front of the stitch doesn’t look exactly like the back of the stitch. So you would need to know what both sides of the stitch looks like. Notice that there is a faint line every 2 rows and if you look along the edge there are bumps from my turning chain. You can use subtle patterns like these to help count the rows too. Here is another example, where I crocheted a swatch using single crochet stitches. How many stitches do you see on the top row? How many rows do you see? Be careful, I used a different crochet stitch here! The answer is below the photo. There are 7 stitches on each row and a total of 6 rows. Again, try counting the V’s at the top of the stitches to get the stitch count. To count the rows, it may be more tricky here since the stitches are sorter and the posts aren’t as distinguished. But you can still see some subtle patterns, such as the faint line that appears every 2 rows. 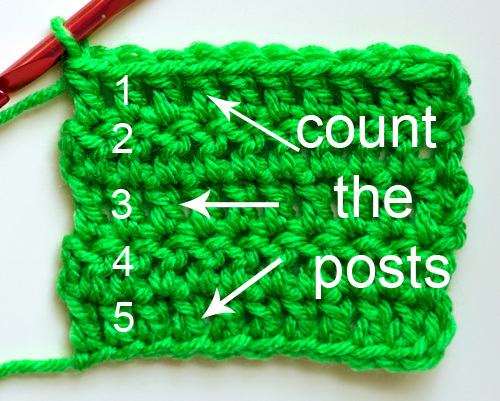 Want more practice counting your stitches and rows? 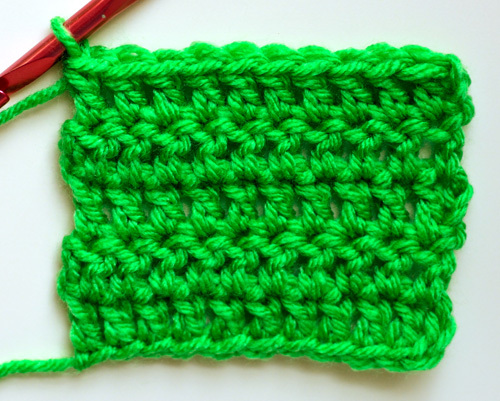 Crochet a small swatch and count as you crochet. You can even tally the number of rows or stitches on a piece of paper if you need to. When you are done, take a look at your swatch and see if you can correctly count the rows and stitches. Challenge yourself by using different stitches! Do you have a tip for counting stitches and rows that you would like to share? Feel free to join the conversation in the comments below! This entry was posted on Thursday, October 20th, 2016 at 12:00 AM by Rachel Choi	and is filed under Tutorials and Help. You can follow any responses to this entry through the RSS 2.0 feed. You can skip to the end and leave a response. Pinging is currently not allowed. Wish I’d had this when I first started crocheting. It was a nightmare counting stitches. I still have a hard time counting rows unless I’m using a multicolored yarn. Very useful tutorial.